Àlà Ipò 22nd ní U.S.
Iyeèrò Ipò 4th ní U.S.
↑ Article 2, Section 9, Constitution of the State of Florida. State of Florida. 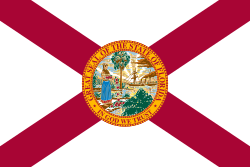 http://www.leg.state.fl.us/statutes/index.cfm?mode=constitution&submenu=3&tab=statutes#A02S09. Retrieved 2008-12-08. .
↑ 2.0 2.1 "2000 Census" (ZIP). US Census Bureau. Retrieved 2007-07-18. ↑ "Annual Population Estimates 2000 to 2008". US Census Bureau. Retrieved 2008-12-25.